The Franklin Police Department is an Accredited Agency that is committed to providing law enforcement services that are fair, impartial, and effective. We will be community partners who seek to solve problems after identifying the needs of our citizens and engaging them as our partner. We seek to improve the quality of life and the public safety of our community through all our endeavors. We strive to be caring, accountable and professional where every employee embraces integrity as the cornerstone upon which the public trust is built. On behalf of the fine men and women of the Franklin Police Department, we welcome you to the Franklin Police Department website and to our community. The Franklin Police Department personnel are well trained professionals through the Kentucky Department of Justice Training Academy. Every member of our department is dedicated to providing the highest level of service to our citizens, businesses, and visitors. We strive to be caring, accountable and professional in all that we do. Every employee embraces integrity as the cornerstone of the public trust that we value so much. I hope that you will take advantage of the many opportunities to be involved in our community and our department. If I, or any member of our staff can be of service, please do not hesitate to contact the Franklin Police Department. Trim shrubbery so it does not block windows or doors and insure that your home has adequate lighting after dark. Leave a spare key with a neighbor or relative instead of keeping it outside. If you choose to place a key outside, insure that it is not kept in an obvious place, such as under a nearby flower pot. Use timers on lights, radios, and television sets to give the impression that someone is home when the house is unoccupied. Timers with a built-in random time function to vary the time that lights, etc. are turned on are the best for accomplishing this task. Local community watch programs help to reduce your chances of being victimized. The Franklin Police Department can provide information on how to establish a community watch program. If your community already has an established program, active participation will help the entire community. Always lock your doors - even if you are only going to be gone a few minutes. Don't leave anything visible inside your vehicle - even something as simple as spare change. Before you open your door, inspect the back seat of your vehicle to ensure that nobody is hiding inside. Choose an ATM that is in a well-lighted area. If you need to use an ATM after dark, ask a friend to accompany you. Don't initiate a transactionif there is anyone around that you find suspicious. Put away your cash, card, and receipt before leaving the ATM machine. If you are going to be away for an extended period of time, copnsider hiring a "house sitter". Leave window coverings as the normally would be. DO NOT stop deliveries? Have a neighbor pick them up for you, as well as circularsthat accumulate by the front door. Turn your telephone ringer down to low or turn on the answering machine if you have a land line. Call the Franklin Polcie Department 270-586-7167 or the KSP Dispatch Center at 270-586-8824 and request extra patrol during the time you are away. What is the process for getting my vehicle back? If my keys are locked in my vehicle, can the Franklin Police open my vehicle for me? Yes, however, the Franklin Police Department will need you to sign a liability release form. If the officer is unable to unlock the vehicle, they will assist you in obtaining the service necessary, such as certified locksmith, to unlock your vehicle. Parents should always follow the car seat manufacturer's instructions and vehicle owner's manual on how to properly install child safety seats. 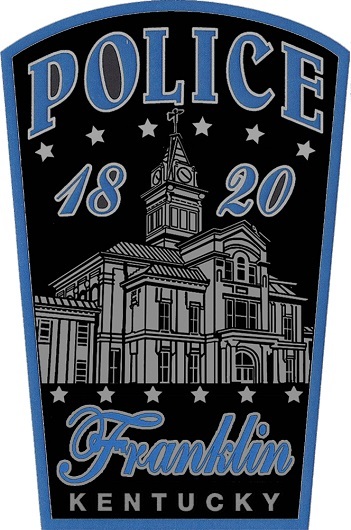 Franklin Police Department has two officers who are trained techinicians available for residents of the City of Franklin. The technicians will inspect the car seat and assist you with the installation to help ensure they are installed properly. To schedule a car safety seat installation, call the Franklin Police Department at 270-586-7167 to set up an appointment. Due to matters of confidentiality, matters that are private or sensitive in nature may not be available to all parties. For clarification contact the records section at 270-586-7167. However, victims of crime or those involved in a collision (including vehicle insurer) may follow these procedures for obtaining copies of a report. The Franklin Police accepts applications for employment regardless of our hiring status. Any valid applications submitted will be included in the next hiring process if the applicant can be reached via phone. For further questions, Email Detective Mike Jones. Applications and other employment forms may be downloaded below. All application documents MUST be typed, printed out, signed where indicated, and submitted. Incomplete or hand written application documents will not be accepted. Applications are only available online since they must be typed. If you are unable to access a computer, the Goodnight Library offers computer use for free and a nominal charge to print. Please read the instructions carefully. Each candidate who meets the minimum requirements must complete the Kentucky Police Officers Professional Standards (POPS) pre-selection physical fitness tests unless already a certified police officer by Kentucky POPS. The Kentucky Law Enforcement Counsel administers the test. Click here for a detailed description of the PT training standards. Each candidate who proceeds to the next step of the process then completes a written examination for the position of Police Officer unless already a Kentucky certified police officer by the Kentucky POPS. Each candidate who proceeds to the next step of the process then goes before an oral board composed of Franklin Police Officers. Each candidate who proceeds to the next step of the process then undergoes an extensive background investigation. Each candidate then meets with a hiring board composed of the Chief of Police, the City Manager, the Personnel Director, and a law enforcement officer from another agency selected by the Chief of Police.. Upon completion of the selection process, the Chief and the City Manager will recommend to the City Commission those candidates for employment. Final approval for appointment is subject to approval of the Franklin City Commission. After being approved by the City Commission , employees are given a conditional employment offer pending completion of a medical examination, psychological examination, polygraph examination, and drug screening. Previously certified employees may not be required to take a polygraph or psychological examination depending on how long ago these tests were performed, at the discretion of the Chief of Police. New employees are then required to take the Franklin Police Department Oath of Office. Unless already POPS certified, all newly hired officers shall be required to execute an employment agreement with the City of Franklin requiring the repayment of all training costs, including, but not limited to salary and travel expenses for Basic Training at the Department of Criminal Justice Training, and in house training if employed for less than three years. After being employed by the City Commission, employees, not already basic-certified, must complete basic training at Richmond, Kentucky. New officers are required to participate in and successfully complete Police Training Officer Program. New officers are on probationary status for one year from date of completing Police Training Officer Program. Probationary status may be defined as that period during which one's employment may be sustained or terminated by the City Commission on the recommendation of the Chief of Police. During probation, the continuing selection process shall include, but not be limited to, random drug-screen testing. Health Insurance Health insurance available, effective the first of the month following employee's full time hire date. Employee/Spouse, Employee/Child, and Family plans are also available. Dental Insurance City pays 100% of Single Dental Insurance effective the first of the month 90 days following employee's full time hire date. Life Insurance City provides life insurance to all full time employees in the amount of two times their annual salary at no cost to the employee, beginning 90 days following their full time hire date. This coverage is increased to three times the annual salary of a Police Officer if the death occurs in the line of duty. Vacation Full time employees accrue paid vacation as follows: Up to one year - One week; One to five years of service - Two weeks; Five to ten years - Three weeks; Ten years or more - Four weeks. Vacation time is accrued, and employees may carry over, from year to year, up to the total amount of vacation time that they can accrue in the then current year, based upon the number of years of service with the City. Medical Leave Employees receive 8 days of paid medical leave per year with a maximum accrual of 180 days. Personal Leave 3 days of earned personal leave per year. Employees must have 6 months without using sick leave, Jan. 1 - June 30, to accrue one personal day. After one year of not using sick leave, (Jan. 1 - Dec. 31), employee earns an additional two personal days. Family Medical Leave Up to 12 weeks of unpaid leave. Employees must use any available paid leave during this time. Funeral Leave Up to three paid days for immediate family. Social Security Employee automatically enrolled upon employment. State Retirement Employee must participate after first 90 days of full time employment. Employees become vested in the system after five years of service. Retirement payments are based on total years of service and the date employee began participation. Deferred Compensation - 457 Plan Participation is optional. Take Home Units Available to officers who qualify.